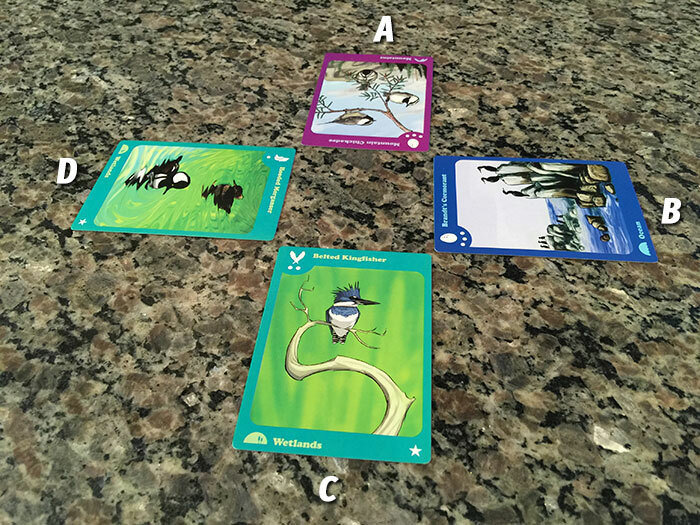 In the uniquely themed set collection card game Birds of Feather, players are attempting to locate and identify birds of all types and from all sorts of habitats. From Stellar’s Jay to Scott’s Oriole; from Red-Winged Blackbird, to Gray-crowned Rosy-Finch. Through the desert, the forest, the ocean, the wetlands and the mountains. Find the most number of birds, or even better identify all the birds from a habitat and you might be the winner of Birds of a Feather. Set up for Birds of a Feather varies based on the number of players. It can play with as few as 1 and as many as 7 but it really shines at higher player counts, so I’ll be talking about a 4 player game. I’m only including the setup for 2-7 here because I think this game is just more fun playing against groups. Your mileage may vary so try it with whatever player counts you’re interested in. In a 4 player game deal each player 15 cards, then provide each player a scoring sheet and the game is ready to begin. Alternately, the producers of this game have created a free scoring app available for iOS, Android, and even a plain old website. I highly recommend you use this instead of the scoring sheets, but more on that later. Birds of a Feather has 5 “suits”, or habitats: the desert, the forest, the ocean, the wetlands and the mountains. Within each habitat are 7 distinct birds of increasing degrees of rarity, between 1 and 3 of each species. 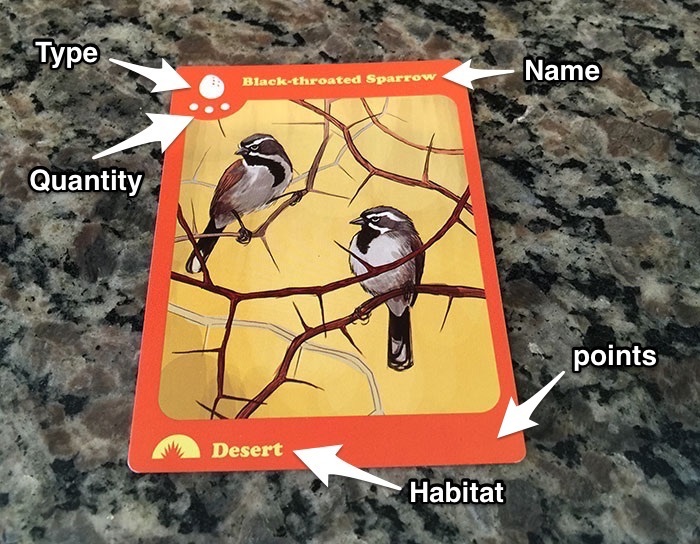 The goal of the game is to have the most points, which are gained by identifying as many distinct species of birds as possible, identifying rare species of birds, and attempting to identify ALL the species of a habitat which will gain you 3 bonus points (per completed habitat). Before we jump into a rules explanation, let’s take a zoomed in look at a card. 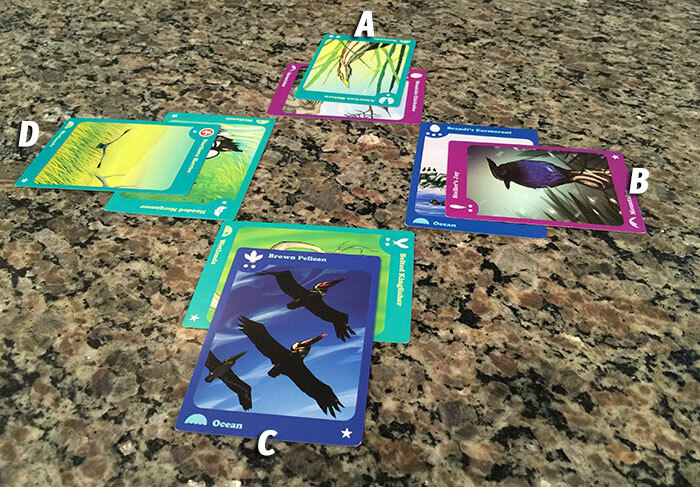 Birds of a Feather is played simultaneously, meaning that each player will select a card from their hand, place it on the table face down, then reveal the cards all at the same time. At that point the table will look something like this. I’ve lettered each player space to make identification easier. After all the cards are revealed each player will mark on their scoresheets the birds they’re able to “see”. Players “see” any bird which they have played, along with any bird from the same habitat played by other players. In the above example, player A would mark off the Mountain Chickadee, player B would mark the Brandt’s Cormorant, and players C and D would each mark the Belted Kingfisher and the Hooded Merganser. To mark a bird as seen find their habitat and type and check it off on your scoresheet. At the end of each round, players will clear any “lingering” birds (birds remaining from the previous round). In round one, there will be no lingering birds so players will skip this step. Players again select their cards, place them face down on the table, and reveal them simultaneously. In round 2 and all remaining rounds players will also be able to see any lingering birds from the same habitat. Let’s take a look at the second round. Player A chose to play the American Bittern to take advantage of the two Wetlands birds from the previous round. Player B selected the Stellar’s Jay so that she could see the Mountain Chickadee. Player C picked the Brown Pelican to see Brandt’s Cormorant. 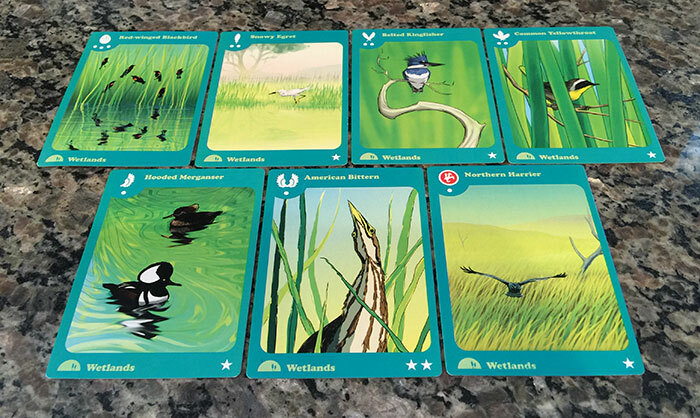 Finally, player D played the Wetlands raptor card represented by the Northern Harrier. The raptor cards are one of the things that take Birds of a Feather from just an okay game to one which requires strategy and planning. 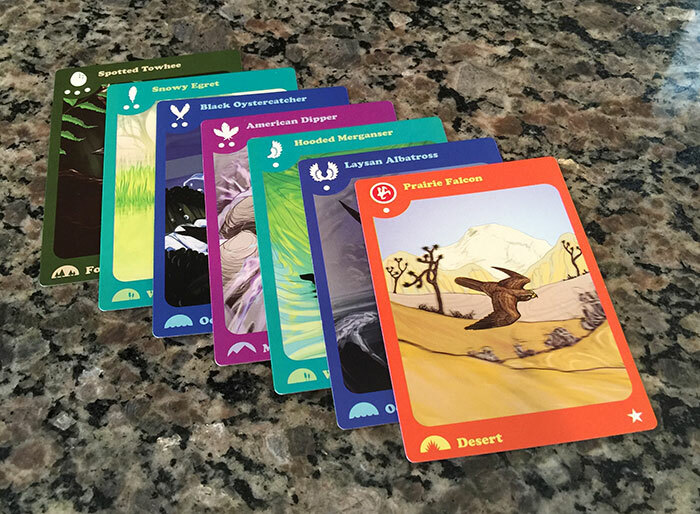 When a raptor card is played, all lingering birds (birds played in the previous round), from the same habitat as that of the raptor are “scared off” and no player is able to see them (including the player who placed the raptor). In this case, the Harrier scares away both the Belted Kingfisher and the Hooded Merganser and neither player A or D would mark the lingering birds. They would both however mark both the Northern Harrier and the American Bittern. Player will continue in this fashion until each player has only a single card left. The game will then be scored. Players have already been marking birds which they’ve seen. They’ll then count up the number of stars in each row, and any bonus stars from seeing every bird in a habitat. Total all the stars and the winner is the person with the most stars. A note about egg cards. 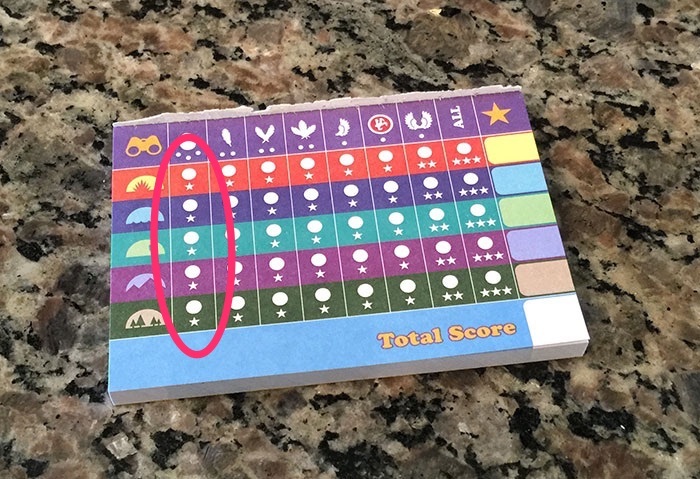 In an unfortunate printing incident the scoring sheets improperly assigned one star to egg cards. This is incorrect. Egg cards are worth no stars. The cards themselves are printed correctly. The first thing you’ll notice about Birds of a Feather is the size; it’s tiny. The box contains only a deck of 60 cards, and a pad of scoring sheets. The next thing you’ll notice is the art, which is amazing. Brightly colored, with fantastic illustrations by Trevor Fristoe and Slim Mittens. But art isn’t everything, how does it play? 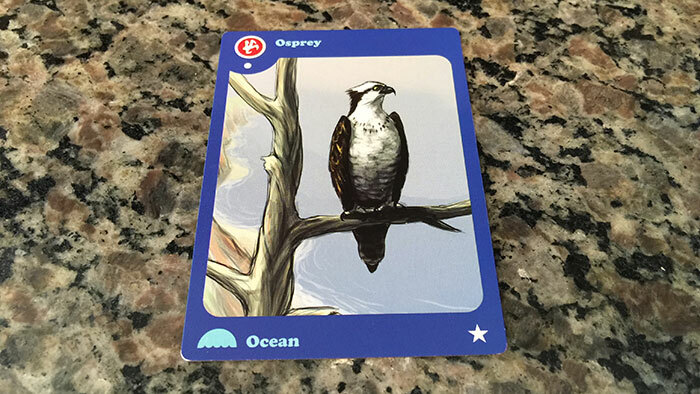 Rest assured that Birds of a Feather is a solid game with a modest amount of strategy. Do you try to land all the birds of one habitat as soon as you can get them out, or do you hold some back in case of a raptor? Should you go for higher value birds first or the lowly eggs? Do you look at your opponents and try to suss out who has the raptors? How many fun 7 player games do you know that have simultaneous selection? Or that are done in less than 30 minutes? Birds of a Feather has all of that, in an attractive package for pretty cheap: $20 at the time of this article. I dislike games with scoresheets…there I said it. I suspect that most gamers feel the same way. But sometimes they’re a necessary evil. The designer of this game probably feels the same way, but they did a great job of mitigating the need by making apps for iOS, Android, and even a swanky mobile web version of the scoring sheet. Download one of the apps to your device, or simply bookmark the mobile scoresheet and start your game. Birds of a Feather began it’s life as a Kickstarter campaign. When it was finally delivered to backers it immediately began lighting up the Twitters. After seeing player after player give a glowing report, I knew I had to pick it up. I’m here to tell you that it delivers, like a stork with a baby. I’ve played it at all player counts except 1 and 2 and it’s just as solid at 3 as it is at 7. Get this game…you won’t regret it! Previous postHive Review – Three Cheers for the Creepy Crawlies!